A Procurement Analyst is responsible for identifying the best product for an organization in terms of quality, price, and benefits. It is very important for a procurement analyst to have strong analytical skills and decision-making skills along with educational qualifications to get hired by a company. 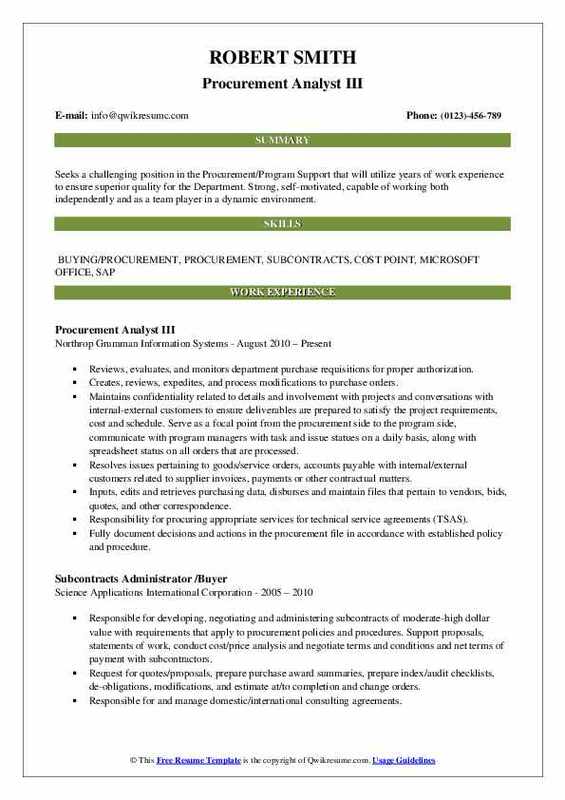 Your resume format should adhere to the guidelines mentioned here in the Procurement Analyst Resume Sample. The basic educational qualification required is a bachelor’s degree. 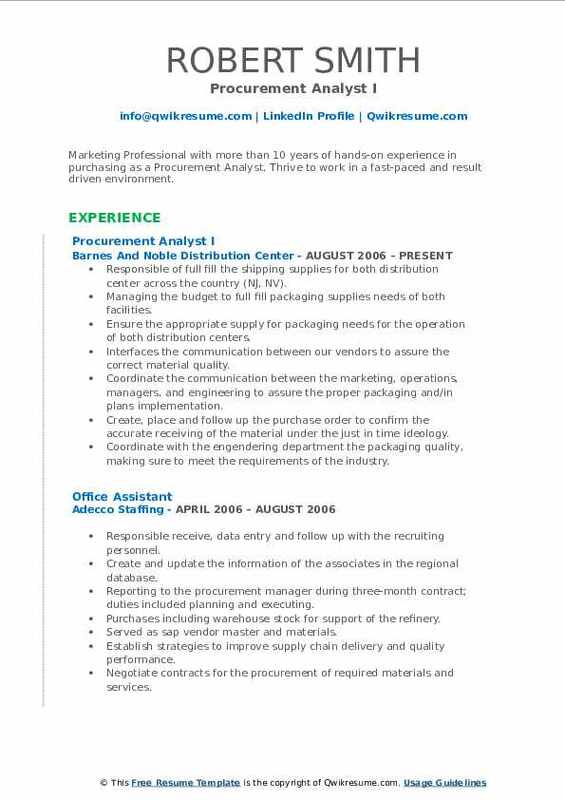 The responsibilities of a procurement analyst are identify the needs of the organization, assess the inventory levels, evaluation of different vendor products on different factors such as availability, quality, price, and reliability, contract with the right vendor, participate in trade shows, conferences, and interview various suppliers, and preparation of reports. It is essential for a procurement analyst to develop the presentation, communication, analyzing, and decision-making skills to accomplish the job role satisfactorily. Objective : Administrative support professional offering versatile office management skills and experience in Microsoft Office programs. Strong planner and problem solver, who readily adapts to change, works independently and exceeds expectations. Able to juggle multiple priorities and meet tight deadlines without compromising quality. Responsible for approximately $30 million in monthly inventory which consists of 19 warehouse locations. Process oracle inventory receiving with vendor packing slips making sure quantity and item correct. Technical issues of items out of inventory daily for plant maintenance and tap off ordering material needed to keep warehouse stocked, special projects, and construction projects. Run daily and weekly reports in epm and Oracle to determine shortages and backorders for all locations. To include Knoxville(13 locations )plus Gadsden, Tuscaloosa, Chattanooga, Huntsville, Florence. Reconciliation of vendor items shipped to include invoicing to the shortage of item shipped incorrectly to accuracy with vendor pod and tracking verifying shipments and having errors corrected. Process inter-org transfers from location to location for requests of inventory. Process input of move orders into Oracle for monthly construction boom and process by transacting out of inventory to specific project allowed. Responsible for the process of weekly cycle counts of inventory for all 19 locations to meet accuracy of inventory and hand status. Responsible for the process of DOA/DCA items no longer used in inventory. Create spreadsheets for tracking of outstanding sales orders to help reconcile inventory and items needed to complete. 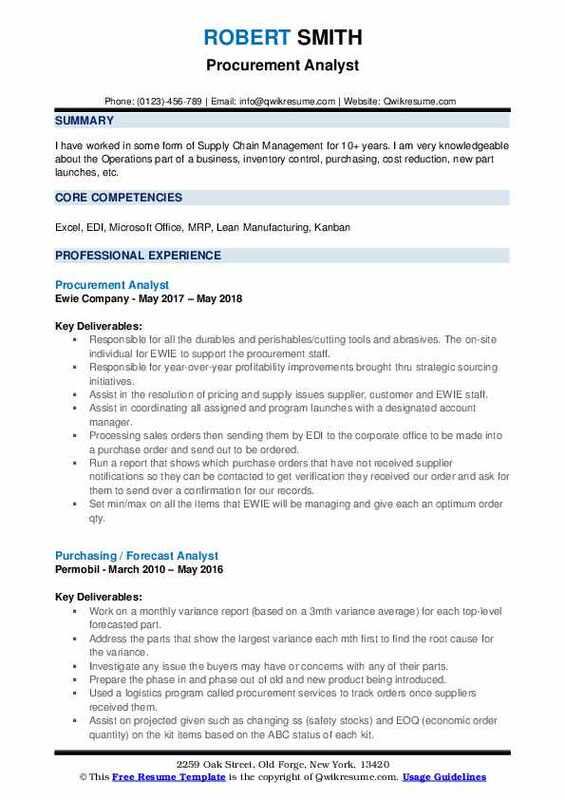 Summary : I have worked in some form of Supply Chain Management for 10+ years. I am very knowledgeable about the Operations part of a business, inventory control, purchasing, cost reduction, new part launches, etc. Responsible for all the durables and perishables/cutting tools and abrasives. The on-site individual for EWIE to support the procurement staff. Responsible for year-over-year profitability improvements brought thru strategic sourcing initiatives. Assist in the resolution of pricing and supply issues supplier, customer and EWIE staff. Assist in coordinating all assigned and program launches with a designated account manager. Processing sales orders then sending them by EDI to the corporate office to be made into a purchase order and send out to be ordered. Run a report that shows which purchase orders that have not received supplier notifications so they can be contacted to get verification they received our order and ask for them to send over a confirmation for our records. Set min/max on all the items that EWIE will be managing and give each an optimum order qty. Any new items that need to be purchased, send as much information as possible (even picture if one is available) to corporate so they can start the quoting process immediately. Responsible for placing all customers spot buys and making sure they arrive at customers requested due date. Send out daily boh, usage, goods receipts reports to the necessary people. Receive the daily receipts in crib-master and remove them off the tracking log, this flags accounting that the order has arrived so they can pay the supplier and invoice the customer. For all the VOI items issued out by the customer, would issue the usage daily against the part number in crib-master. Summary : Seeks a challenging position in the Procurement/Program Support that will utilize years of work experience to ensure superior quality for the Department. Strong, self-motivated, capable of working both independently and as a team player in a dynamic environment. Reviews, evaluates, and monitors department purchase requisitions for proper authorization. Creates, reviews, expedites, and process modifications to purchase orders. Maintains confidentiality related to details and involvement with projects and conversations with internal-external customers to ensure deliverables are prepared to satisfy the project requirements, cost and schedule. Serve as a focal point from the procurement side to the program side, communicate with program managers with task and issue statues on a daily basis, along with spreadsheet status on all orders that are processed. Resolves issues pertaining to goods/service orders, accounts payable with internal/external customers related to supplier invoices, payments or other contractual matters. Inputs, edits and retrieves purchasing data, disburses and maintain files that pertain to vendors, bids, quotes, and other correspondence. Responsibility for procuring appropriate services for technical service agreements (TSAS). Fully document decisions and actions in the procurement file in accordance with established policy and procedure. Assist other coworkers with their requisitions and purchase orders that need to be processed in a timely fashion. Independently demonstrates knowledge and comprehension of expectations to perform professional tasks. Assist with material pricing in proposal phases and works closely with program managers to ensure the best possible delivery times are met. Prepares/issue solicitations (RFQ and RFP) with appropriate flow downs and terms conditions required. Negotiate terms and conditions to meet contract/program targets/schedule for applicability and risk. 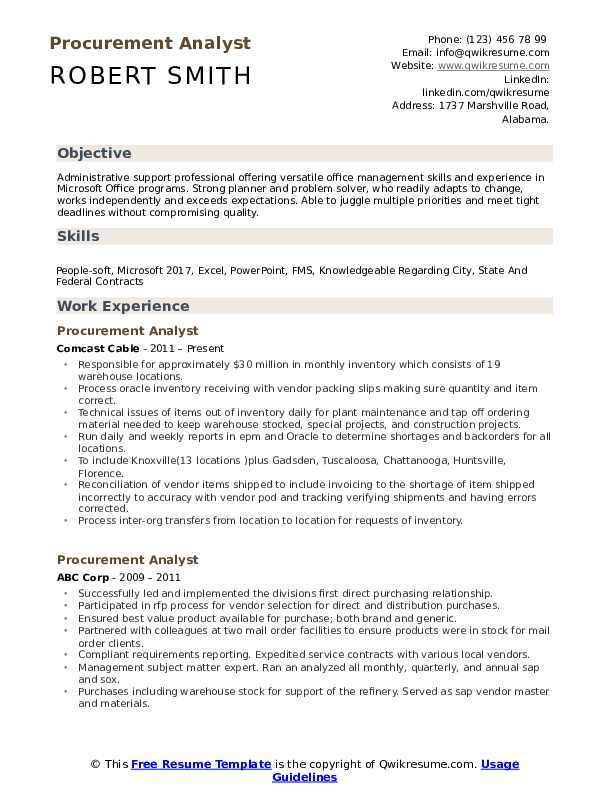 Summary : Marketing Professional with more than 10 years of hands-on experience in purchasing as a Procurement Analyst. Thrive to work in a fast-paced and result driven environment. Responsible of full fill the shipping supplies for both distribution center across the country (NJ, NV). Managing the budget to full fill packaging supplies needs of both facilities. Ensure the appropriate supply for packaging needs for the operation of both distribution centers. Interfaces the communication between our vendors to assure the correct material quality. Coordinate the communication between the marketing, operations, managers, and engineering to assure the proper packaging and/in plans implementation. Create, place and follow up the purchase order to confirm the accurate receiving of the material under the just in time ideology. Coordinate with the engendering department the packaging quality, making sure to meet the requirements of the industry. Coordinate with the vendor maintenance the correct packaging needed for the special products. Facilitate the communication between operations department and finance department. Support the finance department with the accounting codification for all the charges generated for operations. Responsible to coordinate the communication between the maintenance department and the suppliers/vendors responsible to supply the material for our automatic carton processors. Support the operations, it, maintenance departments to place orders, follow up, confirming the proper delivery time and the good combination between price/quality. 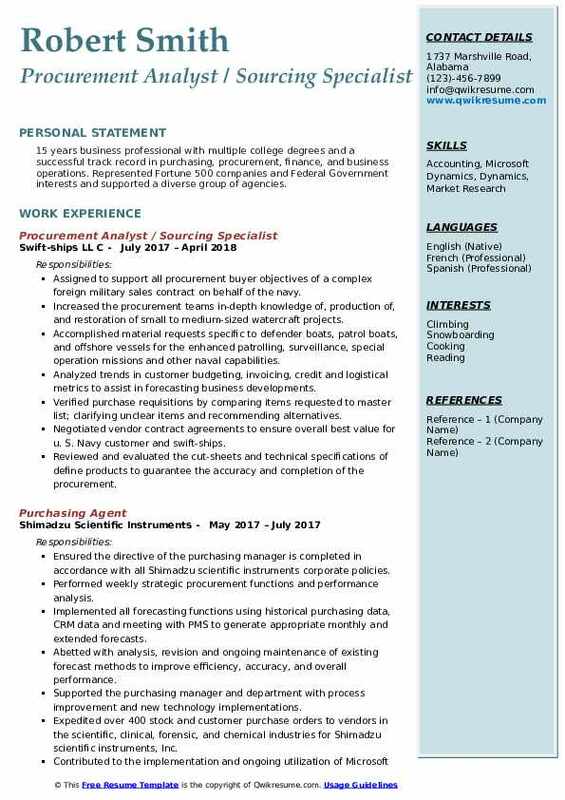 Objective : 15 years business professional with multiple college degrees and a successful track record in purchasing, procurement, finance, and business operations. Represented Fortune 500 companies and Federal Government interests and supported a diverse group of agencies. Assigned to support all procurement buyer objectives of a complex foreign military sales contract on behalf of the navy. Increased the procurement teams in-depth knowledge of, production of, and restoration of small to medium-sized watercraft projects. Accomplished material requests specific to defender boats, patrol boats, and offshore vessels for the enhanced patrolling, surveillance, special operation missions and other naval capabilities. Analyzed trends in customer budgeting, invoicing, credit and logistical metrics to assist in forecasting business developments. Verified purchase requisitions by comparing items requested to master list; clarifying unclear items and recommending alternatives. Negotiated vendor contract agreements to ensure overall best value for u. S. Navy customer and swift-ships. Reviewed and evaluated the cut-sheets and technical specifications of define products to guarantee the accuracy and completion of the procurement. Confirmed all requested materials are properly requisitioned, ordered, delivered and expedited to company and customer expectations. Formulated bid selection sheets to review, justify, and score three specific sources for awarding each competitive bid and purchasing action for factors including maximum payment terms, manufacturer, origin, product quality, competitive pricing, supplier responsiveness, fewest material discrepancies and most efficient schedules. Authenticated receipt of items by comparing items received to items ordered; resolves shipments in error with suppliers. 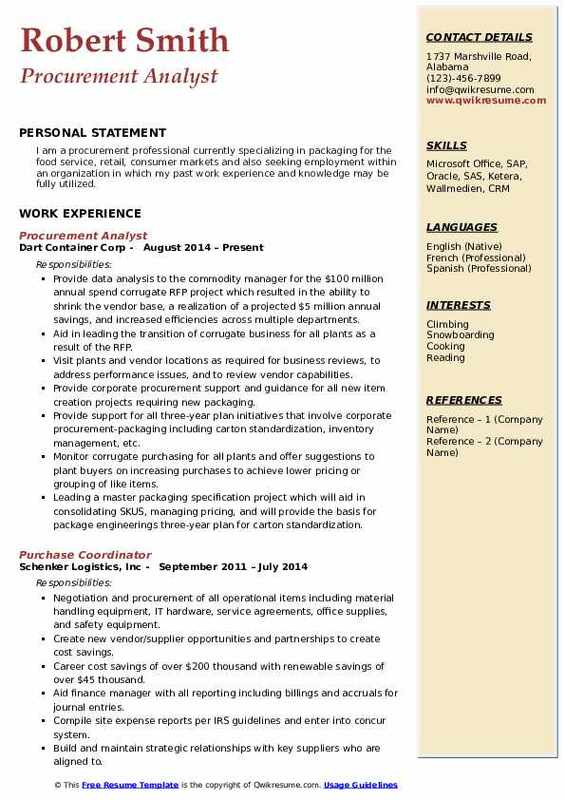 Summary : I am a procurement professional and currently specializing in packaging for the food service, retail, and consumer markets. I am also seeking employment within an organization in which my past work experience and knowledge may be fully utilized. Provided data analysis to the commodity manager for the $100 million annual spend corrugate RFP project which resulted in the ability to shrink the vendor base, a realization of a projected $5 million annual savings, and increased efficiencies across multiple departments. Aided in leading the transition of corrugate business for all plants as a result of the RFP. Provided data analysis to the commodity manager for the $5 million annual spend folding carton RFP which resulted in vendor base changes, a realization of a projected $1 million annual savings, and greater flexibility with our vendors. Responsible for managing the folding carton contract programs and VMI program with an annual spend of $3. 5-4 million annually. Visit plants and vendor locations as required for business reviews, to address performance issues, and to review vendor capabilities. Provide corporate procurement support and guidance for all new item creation projects requiring new packaging. Provide support for all three-year plan initiatives that involve corporate procurement-packaging including carton standardization, inventory management, etc. Monitor corrugate purchasing for all plants and offer suggestions to plant buyers on increasing purchases to achieve lower pricing or grouping of like items. Leading a master packaging specification project which will aid in consolidating SKUS, managing pricing, and will provide the basis for package engineerings three-year plan for carton standardization. Member of cross-functional teams that involve corporate procurement-packaging including master data, package engineering, and production planning. Provide multiple marketing departments and account executives with current inventory levels and value of packaging for depletion planning purposes. Process purchase orders for special project purchases, packaging tooling, and packaging trials. Summary : Responsible for creating a blueprint for procurement processes using Oracle procurement tools and training employee on procurement policy and guidelines. Functions include conduct and support negotiation with vendors on service agreement and statement of work. Assist in the development of the master service agreement, non-disclosure agreement, software licensing agreement, saas agreement, and consulting service agreement. Work with suppliers and internal clients to identify and research problems relevant to the service agreement and establish remediation process. Collaborate with procurement and finance teams on regular bases to develop process improvement strategies. Manage procurement and other related project, vendors contract renewal process, and onboard new suppliers. Coordinate with a supplier in acquiring all necessary documents to process, and generate a purchase order. Work with service providers and suppliers to understand payment terms. Build a good relationship with suppliers and help to identify ways to mitigate risk and lower cost. Work with suppliers to ensure compliance with the requirement, quality, and delivery performance. Develop a strategy for continuous improvement in the procurement of good and services. Lead and establish a requirement for onboarding of legacy vendor, business-critical vendors. Supervise procurement activities: quotation, purchase requisition, and approval, po generation and invoice payments. 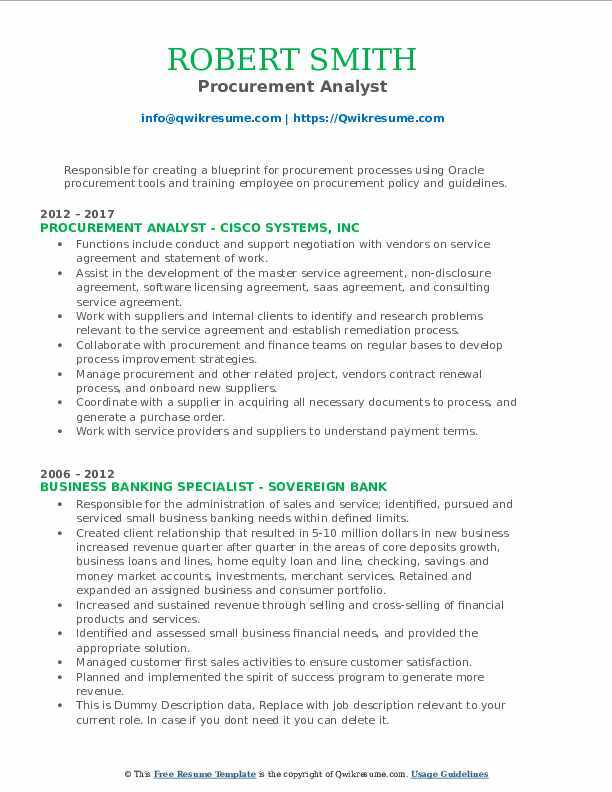 Summary : Results-oriented professional with extensive experience providing financial analysis and reporting across large supply chains. Capable of synthesizing and presenting complex financial data in facilitating and supporting short and long-term financial/supply chain strategies. 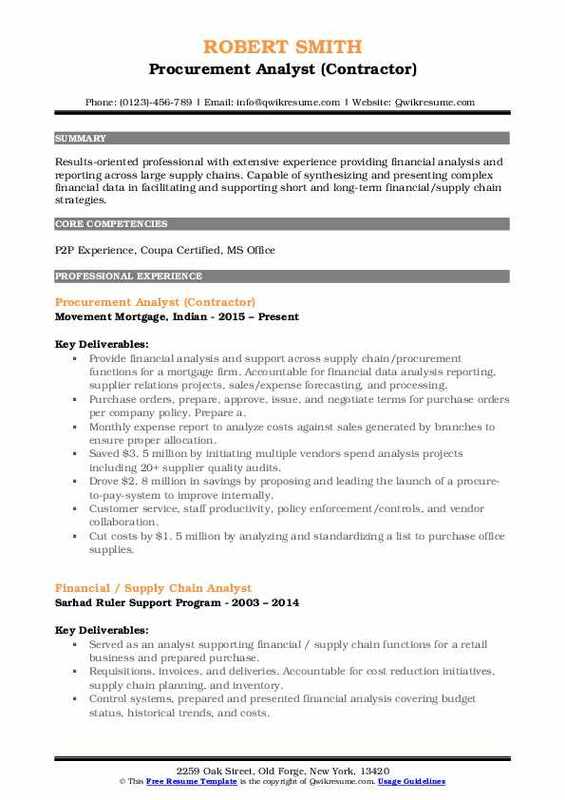 Provide financial analysis and support across supply chain/procurement functions for a mortgage firm. Accountable for financial data analysis reporting, supplier relations projects, sales/expense forecasting, and processing. Purchase orders, prepare, approve, issue, and negotiate terms for purchase orders per company policy. Prepare a. Monthly expense report to analyze costs against sales generated by branches to ensure proper allocation. Saved $3. 5 million by initiating multiple vendors spend analysis projects including 20+ supplier quality audits. Drove $2. 8 million in savings by proposing and leading the launch of a procure-to-pay-system to improve internally. Customer service, staff productivity, policy enforcement/controls, and vendor collaboration. Cut costs by $1. 5 million by analyzing and standardizing a list to purchase office supplies. Implemented and maintained a new contract management system to streamline the contract management process. And ensure all key stakeholders (legal, compliance, and accounting) were on board prior to contract execution. Cut costs by $5. 19 million by negotiating favorable terms and conditions with providers of furniture, internet, network. Increased working capital across the organization by developing and implementing KPIs to track budget versus actual. Spend as part of efforts to identify cost reductions and efficiency opportunities across procurement processes. 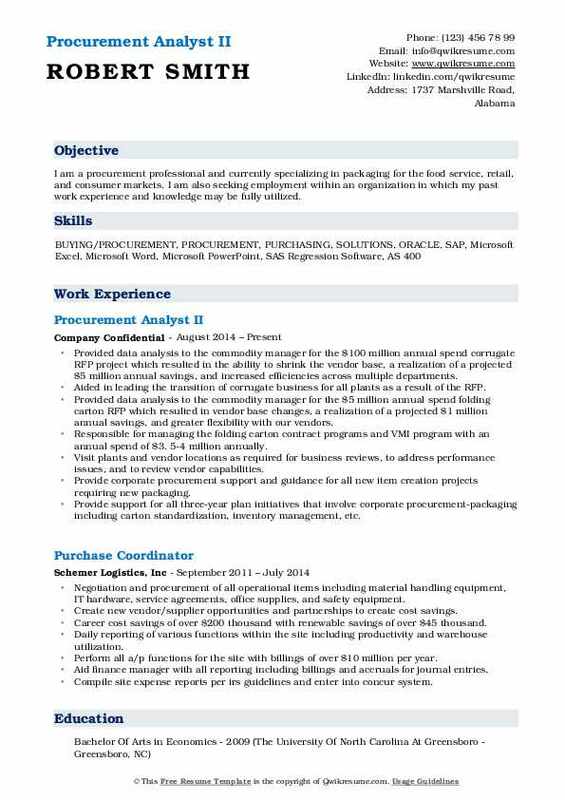 Summary : I am a procurement professional currently specializing in packaging for the food service, retail, consumer markets and also seeking employment within an organization in which my past work experience and knowledge may be fully utilized. Provide data analysis to the commodity manager for the $100 million annual spend corrugate RFP project which resulted in the ability to shrink the vendor base, a realization of a projected $5 million annual savings, and increased efficiencies across multiple departments. Aid in leading the transition of corrugate business for all plants as a result of the RFP. 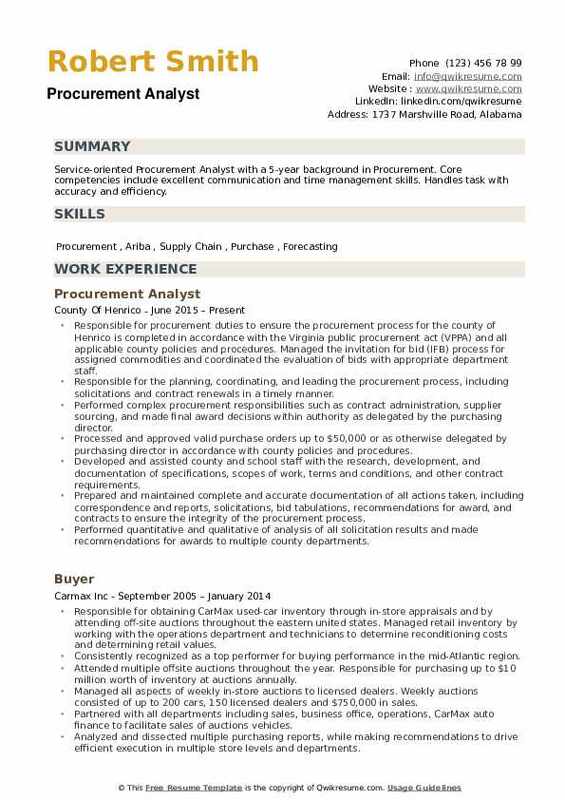 Summary : Service-oriented Procurement Analyst with a 5-year background in Procurement. Core competencies include excellent communication and time management skills. Handles task with accuracy and efficiency. Responsible for procurement duties to ensure the procurement process for the county of Henrico is completed in accordance with the Virginia public procurement act (VPPA) and all applicable county policies and procedures. Managed the invitation for bid (IFB) process for assigned commodities and coordinated the evaluation of bids with appropriate department staff. Responsible for the planning, coordinating, and leading the procurement process, including solicitations and contract renewals in a timely manner. Performed complex procurement responsibilities such as contract administration, supplier sourcing, and made final award decisions within authority as delegated by the purchasing director. Processed and approved valid purchase orders up to $50,000 or as otherwise delegated by purchasing director in accordance with county policies and procedures. Developed and assisted county and school staff with the research, development, and documentation of specifications, scopes of work, terms and conditions, and other contract requirements. Prepared and maintained complete and accurate documentation of all actions taken, including correspondence and reports, solicitations, bid tabulations, recommendations for award, and contracts to ensure the integrity of the procurement process. Performed quantitative and qualitative of analysis of all solicitation results and made recommendations for awards to multiple county departments. Provided guidance to various county and school departments as well as bidders and suppliers, regarding the procurement process to ensure compliance with the VPPA and all applicable county policies and procedures. Met with multiple bidders and vendors to resolve questions or challenges related to solicitations, awards, or contracts. Responsible for purchasing all automotive and heavy equipment for the county of Henrico to include police cars, fire engines, ambulances, school buses, and medium and heavy-duty trucks. Purchased over $6,000,000 of automotive equipment for the county in the past year. Successfully developed and completed 15 informal solicitations (IFB) from research with departments through contract completion in the first year of employment.